This is my favorite dish that I make. We always make it for friends and family when they come to visit, and we also make it just for ourselves (usually in bulk so we can savor the leftovers!) It is one of those dishes that is almost better on the second day. 1. 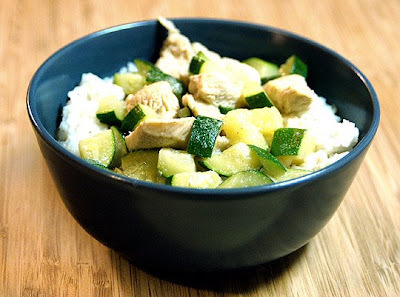 Cut chicken and Zucchini into small pieces, set aside. 2. Pour half of the can of coconut milk into a large saucepan. Turn burner onto medium-high, and when the milk starts to bubble and boil, add the green curry paste (you can add more curry paste for added hotness!) and stir it until it is mixed in thoroughly. 3. Add the chicken and keep stirring for 1-2 minutes until chicken is coated with the curry and coconut milk mixture. 4. Add the remaining coconut milk, the zucchini, fish sauce, sugar, chicken broth, half of the basil (chopped), and water to the saucepan, and heat until simmering. Once the mixture is simmering, you don't want it to come to a full boil or your chicken will become rubbery. Keep it on a light simmer, and make sure to stir it occasionally. 5. When zucchini is tender, your curry is almost done. All you need to do is add the cornstarch (make sure to mix the cornstarch with a tablespoon or two of water before you add it to the curry) and stir it in. This will thicken the sauce slightly. 6. Fill bowl halfway with rice, and pour the curry over the top. Garnish with the remaining basil. Enjoy! *If you want to make a vegetarian version of this, use firm tofu instead of the chicken, veggie broth instead of the chicken broth, and a teaspoon of salt instead of the fish sauce. And for the small print, please do not take content or images found on this site for use elsewhere without first contacting me for permission. Thank you!